Honolulu’s rail project is hoping to save costs by partnering with private companies in a process known as a public-private partnership, or “P3.” But experts say that nationally many rail P3s have enabled the government project managers to duck budgetary limits in the short run and spread their higher costs over the long run. The push for a P3 comes as the Honolulu Authority for Rapid Transportation (HART), tasked with building and operating the rail, faces an ultimatum from the Federal Transit Administration (FTA) to produce a balanced budget for the project, which currently is $178 million in the red. He said P3s allow government entities to get around their debt limits, by essentially outsourcing their debts to the private parties. This is done through a process known as “availability payment,” or AP. It’s like borrowing a credit card from a friend and promising to make monthly payments, with the debt appearing on the friend’s account. However, the debt incurred by the AP model can negatively affect the government’s credit rating, according to the study, and this has led many states to create policies that guard against using the AP model, such as Indiana, Texas, Virginia, Maryland, Florida and North Carolina. Poole, whose credentials include being a board member of the Public-Private Partnerships (P3) division of American Road and Transportation Builders Association, suggested that rather than count on annual government payments, private companies should be given rights to collect toll fares, which would be a safer way to structure state and municipal budgets, since taxpayers are not exposed to any risks if the projects fail to meet their ridership projections. Poole gave the example of a failed toll road in Brisbane, Australia, which spared taxpayers from bearing the risk by allowing a private company to collect toll fares, instead of using an AP structure. The Brisbane toll had less than half the projected riders after it opened. “Had this project been developed as a state-tolled AP concession, taxpayers would have been on the hook for decades to make up the revenue shortfall,” he said. HART’s plan to offer availability payments instead of toll fare revenues may be a sign that the rail project is not financially viable, since offering toll fare revenues may not attract private partners. Nevertheless, at its Sept. 27 board meeting, HART approved a P3 based on a planwith “availability payments” for the future financing of rail. That plan would ask private partners to pay for approximately $1.6 billion in rail construction costs, which HART would be responsible for repaying over time, and this would supposedly result in a total construction cost savings of between $81 million and $163 million. HART may have extra incentive to jumpstart the P3 process, and perhaps give the contract to Ansaldo, the current construction contractor tasked with building the project, because Ansaldo is seeking a “mega-substantial” compensation from HART for construction delays. This could give HART the incentive to award the P3 contract to Ansaldo, in hopes that Ansaldo would hit the “reset button,” and lower the “mega-substantial” requested compensation. In any case, whether or not the estimated savings materialize, the P3 would, in effect, give HART a way to avoid tough questions with taxpayers in the short term, while keeping costs going in the long term. If the project were simply exceeding its budget, rail officials probably would need to ask residents if the cost of rail is too high to continue. The P3 plan might enable the rail project to avoid the FTA’s budget limit by shifting short-term costs to a private partner’s books, while spreading those costs to taxpayers well into the future. The timing of HART’s P3 initiative as the project attempts to squeeze under its budget limit is just another reason why it’s important to audit the rail for fraud, waste and abuse, to ensure that the true costs of rail are known beforehand, and not passed onto future generations. Marcel Honore “Federal Agency Issues New Ultimatums on Honolulu Rail,” Honolulu Civil Beat, Sept. 21, 2018, available at https://tinyurl.com/ycottd3d. $44 million in operations costs in 2018 and 2019 + $134 million in additional costs, as stated by Marcel Honore, “Feds To City: Show Us The Rail Money Now,” Honolulu Civil Beat, Oct. 24, 2018, available at https://tinyurl.com/yb2x5c7m. Randal O’Toole, “Romance of the Rails,” Cato Institute, Washington, D.C., Oct. 26, 2018, available at https://tinyurl.com/ybsqz8ck. Randal O’Toole, “Transit Tall Tales and Coping with Too Much Money,” Georgia Public Policy Foundation, Oct. 10, 2014, available at https://tinyurl.com/y7vysvdc. Robert W. Poole Jr., “Availability Payment or Revenue-Risk P3 Concessions? Pros and Cons for Highway Infrastructure,” Reason Foundation, November 2017, available at https://tinyurl.com/y8tn3cb5. Cameron Atfield, “Gap between Brisbane tunnel expectations and reality continues to widen,” Brisbane Times, March 9, 2017, available at https://tinyurl.com/ybgenr3t. 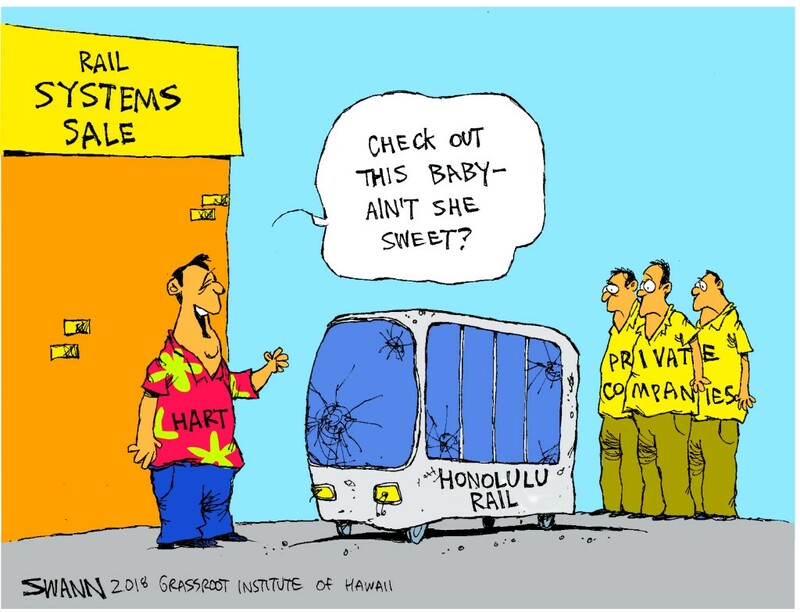 Stewart Yerton, “HART Wants a Private Company To Finish The Honolulu Rail Project,” Honolulu Civil Beat, Sept. 27, 2018, available at https://tinyurl.com/ycek3pgy. Ernst and Young Infrastructure Advisors, LLC, “Public Private Partnership Commercial Viability Analysis: Honolulu Rail Transit Project,” May 24, 2018, page 8, available at https://tinyurl.com/ycv862wx. $81 million and $163 million figures found by calculating 5 percent to 10 percent of the estimated construction cost of $1.627 billion P3 project, as stated in the “Public Private Partnership Commercial Viability Analysis: Honolulu Rail Transit Project,” May 24, 2018, page 12, available at https://tinyurl.com/ycv862wx. Kevin Dayton, “Honolulu rail contractor Ansaldo wants compensation for construction delay,” Honolulu Star-Advertiser, Sept. 7, 2018, available at https://tinyurl.com/yc3ln6dd. Honolulu Authority for Rapid Transportation board meeting, Sept. 6, 2018, YouTube video at 49:53, available at https://tinyurl.com/ycr4msff. Ibid, at 51:27, available at https://tinyurl.com/y8zltn5j.